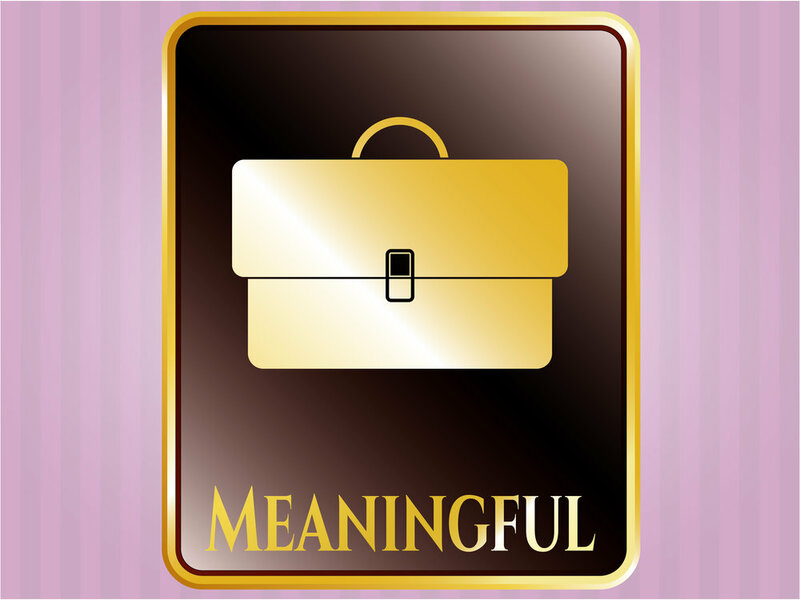 If you're reading this, you're probably already aware of the value of meaningful work. The research tells us that the value to those performing the work is that they feel better and actually are better - at work and in life. The value to those paying those performing the work is better performance, better teamwork, and better retention. Some studies conclude that managers can't make work meaningful, but they can make it meaningless - so NOT destroying meaning is the (low) bar. Others, like experts Dave and Wendy Ulrich in The Why of Work (McGraw Hill), lay out a strategic framework for leaders who ask themselves "Why aren't my employees working harder?" by asking instead, "Why are my employees working (at all)?" In Harvard Business Review, Lewis Garrad and Tomas Chamorro-Premuzic dive even deeper by outlining four key personality characteristics that, in combination, enable a leader to make other people's jobs more meaningful. I highly recommend both of these for leaders of leaders and those familiar with personality assessment. But, if you don't know how meaningful work contributes to business performance, go back and read the hyperlinked studies in the first paragraph. If you do, and are wondering how to be a meaningful manager, do these three things. Frame their development toward what's most meaningful to them. Sharing what's meaningful to you comes after asking of others - don't be that person who shares first and asks later if ever. But, sharing yours (really sharing yours, not something you read or the company's vision statement...) provides people with insight into who you truly are and are about. The more personal you make it, the more authentic hence more credible it is. My professional mission since 1996 has been to "Cast light on the path to salvation by developing people and the organizations in which they work." I don't say what salvation is, but whatever it is for someone, I hope to help them toward that individually and through the right environment. When I explain that (and they always ask), it not only shares and makes me more accountable for who I intend to be, it also invites them to be equally candid in reply, or as candid as they choose to be. Now you don't need a super personal statement to give insight into what gives your work meaning, but you must share something real. If you are all about advancement and economic gain, it's better to share that and the mutual benefits for those around you than try to cover it with some altruistic pablum or company motto - that's what a meaningless manager does - and people see through it - eventually always. There have been many contradictory, interesting and even entertaining articles and books written about doing what you love - you can/you can't, you'll be broke/the money will follow, etc., etc. Let's not confuse having meaningful work with loving what you do. I volunteer patient care at a local hospice - it's meaningful work, but I don't always love it. But like any other role or job, some parts of the work provide immeasurable meaning to me, while other parts are just what has to get done to allow those more meaningful parts. (The mindfulness practitioner can find value in every task including dishwashing, but that's a different article). Let's not confuse having meaningful work with loving what you do. At times, everyone needs a broader perspective to shift their attention and increase their awareness of how seemingly meaningless tasks contribute to a more meaningful outcome (CEOs and dishwashers). The meaningful manager can "string it" by illuminating the line of sight from task-to-outcome that makes the connection. This isn't always easy because it assumes two things - 1. the tasks are valuably aligned and 2. the outcome is itself meaningful to someone. If this isn't the case, the meaningful manager addresses that first. When that's clear, the meaningful manager educates and reminds people how what they do contributes to what gets done. The meaningful manager knows how to compassionately empathize without being naively positive or pessimistically negative. Meaningless managers use quotes like, "Ours is not to reason why, ours is but to do and die," or the more current version, "It is what it is...". Meaningful managers don't confuse pessimism with realism or believe workplace misery loves company. They do, however, realize that they have an impact on the meaningfulness of those around them - for better and for worse. A simple, regular practice of asking, sharing, and stringing can make the difference between meaningless and meaningful at work.